Blake Griffin playing the role of Jackie Moon. The Pistons were lucky enough to play a depleted Mavericks team on Thursday night, following the trade that sent Kristaps Porzingis from the Knicks to the Mavericks in a seven-player deal earlier in the day (Mavs rookie star Luka Doncic also sat out with an ankle injury). But Detroit only came away with a four-point victory (93-89), and a play in the fourth quarter showed how the Pistons made things pretty tough on themselves. 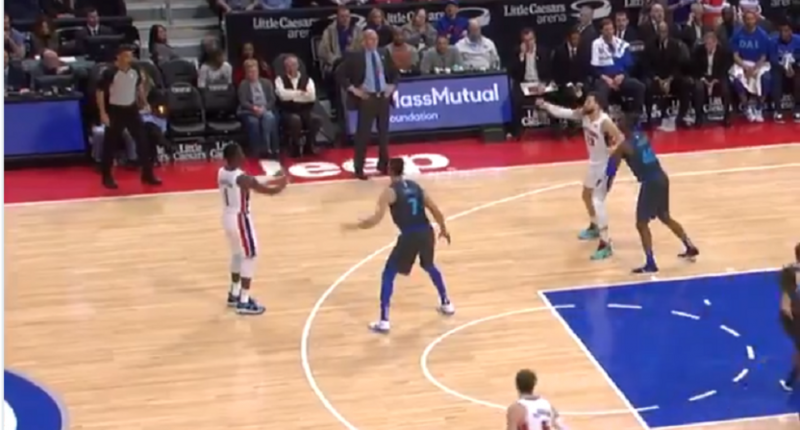 Detroit point guard Reggie Jackson and power forward Blake Griffin passed the ball back and forth to each other for about 14 seconds, while Griffin tried to post up. The possession finally ended with zero shots getting up, and Griffin getting called for a three-second violation. Blake Griffin’s antics would make Jackie Moon (Will Ferrell) proud; Moon did the same thing for the Flint Tropics in the 2008 film Semi-Pro.